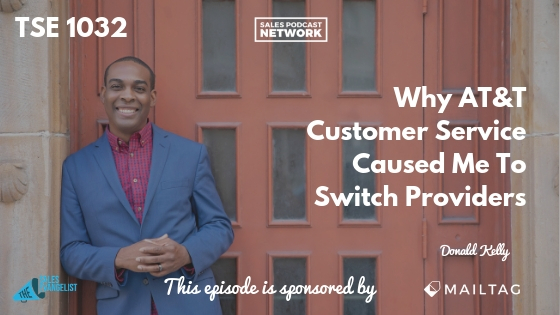 On today’s episode, I share why sellers must stay focused on their customers, and why AT&T customer service caused me to switch providers. My phone was disconnected. I couldn’t receive calls from my clients or from my family. This episode goes beyond sales and is more than just another episode. Salespeople sometimes forget that people matter, so let my experience with a disconnected phone serve as a direct reminder about the need for quality customer service. Too often, large companies don’t seem to care about small individuals. As such, I feel a moral obligation to use my platform to share this incident so that others may benefit from my experience. I remember back in 6th grade when my mom got me a pager from BellSouth. I felt like the coolest kid on campus. My friends could reach out to me and I could send messages to them; it was all very exciting. I got my first prepaid cell phone in 7th grade, also from BellSouth. I became an AT&T customer when they acquired BellSouth and I had no complaints. Eventually, I moved to the Nokia phone with text messages and minutes – and, of course, I chose AT&T. When I moved away to college, I tried to take AT&T with me but there weren’t a lot of cell towers back then so it couldn’t happen. They released me from my contract and I signed on with Verizon. Verizon was fine but I was excited when AT&T expanded its coverage and I could use them once again with my new iPhone. My family and I used AT&T for everything. It was a sad day when we moved and had to switch to Comcast but it was exciting when we were eventually able to switch back once again. We understand that companies grow, things happen, and changes are made. We didn’t like all of AT&T’s new ideas but we rolled with the punches and kept moving. A lot of plans have changed in the industry. There is a different structure to leasing phones now, for example. They also offer a prepaid plan where, if you pay off your phone, you have unlimited use for just $45 a month through an automatic bank withdrawal. Sounded good to me! Text notifications let you know when the amount will be withdrawn from your account so you can prepare. It was all running smoothly until we noticed some fraudulent activity on our bank card during the holiday season. We decided to cancel the card and apply for a replacement. About two weeks later, AT&T disconnected my phone, so I called them right away. I certainly accept responsibility for my share of the problem but let me tell you what happened. Because my plan had ‘expired,’ they had cancelled my services – without notifying me. Additionally, the prepaid plan that I had enrolled in was offered only as a limited promotion. To obtain the same plan again would cost me $65 a month. The money was not the issue. The principle certainly was. The customer service representative told me that because the plan had expired, I could not renew it despite that I had never canceled it. My years of loyalty as an AT&T customer were meaningless. What was my incentive to stay with a company that did not return the same level of loyalty, or care, toward me? I didn’t have time to argue. Since I needed my phone for work, I agreed to the higher plan, but only while I courted new companies, namely T-Mobile. I raised the question on social media and found not only that people seem to love T-Mobile but, at the same time, there have been an increasing number of dropped calls with AT&T service. It is definitely time for a change. The lesson behind this story: remember that your customers and your clients are people. Cultures change and some companies get stuck in archaic ways of thinking. They will move to businesses that give them attention; ones that are more nimble and flexible. Don’t let your business model be stuck in the past, unwilling to deviate from the old standard. Are you flexible? Do you bend to help your customers or do you expect them to bend toward you? This month, as we focus on client success and customer service, I urge you to evaluate the way you treat your clients. Are you putting the people who pay you first? This episode is brought to you by the TSE Certified Sales Training Program. If you put in a lot of hard work in 2018 but weren’t able to close many of your deals, we can help you fix that. We have a new semester beginning in April and it would be an honor to have you join. Visit thesalesevangelist.com/CST. 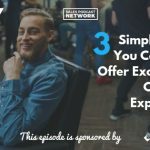 Check out BombBomb, Loom, Wistia, and Soapbox to help you make emotional connections with your prospects by embedding videos into your emails. This episode is also brought to you in part by mailtag.io, a Chrome browser extension for Gmail that allows you to track and schedule your emails. It’s super easy, it’s helpful, and I recommend that you try it out. You’ll receive real-time alerts anyone opens an email or clicks a link. Donald is the host of the popular sales podcast,"The Sales Evangelist". He is the founder of The Sales Evangelist Consulting Firm where he helps small companies develop killer sales process to scale their business and increase growth. Donald is also an award-winning speaker, sales trainer, and coach. He's a big fan of traveling, South Florida staycations and high-quality family time. Donald has a belief that “anyone” can sell if they have the desire and receives the proper training. TSE 557: When Should I NOT Bring on a Client?